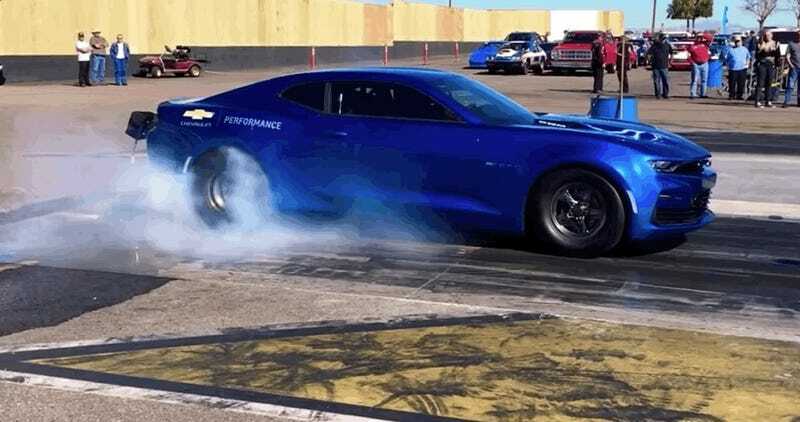 Chevy showed off an electric Camaro at SEMA last year that was built in part by a Washington state shop teacher and his students, saying that the 700-horsepower beast was capable of a nine-second quarter-mile time. Well, it finally got to the track, and while it didn’t do nine seconds, it was close. Electric cars get such great acceleration thanks to instant torque, so it’s not surprising that the eCOPO is quick, though Cody Lane, who posted the video, said that it was only operating at 80 percent power. The car was built by GM in partnership with Hancock and Lane Racing, in addition to Patrick McCue, a shop teacher in Bothell, Washington, outside of Seattle, and his students. The Camaro’s powered by two BorgWarner HVH 250-150 motor assemblies, which each make 300 lb-ft of torque, for a total of 600 lb-ft. The car has a 56 percent rear weight bias, which Chevy says helps with launch and, as you can see in the vid, that might also have something do with the wheelie the Camaro pops at the beginning of the race. This particular car is not a production car, and never will be, though Chevy has previously said that it might offer crate electric motors like the one in the eCOPO at some point. COPO, by the way, stands for Central Office Production Order, a term originating to 1969, when a dealer ordered parts from Chevy to build his own custom Camaro. Fifty years later, it’s happily still with us.